A few weeks ago Schroeder's name tag fell off in the back yard and we couldn't find it. I was going to go online and buy him a new cute tag (because face it, the metal ones from pet stores are so dull), but I suddenly had a moment of genius: LOST! 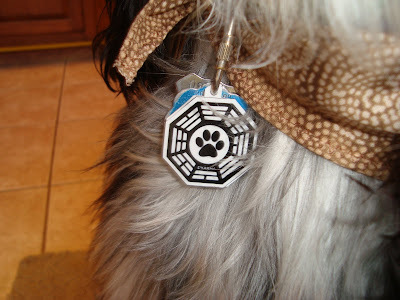 I would make a Dharma Initiative pet tag. I bought some Shrinky Dinks plastic paper, created a Dharma logo with a paw print in the middle, and made a back side with Schroeder's name and contact phone number. I put the large printed tags in the oven where Shrinky Dinks magically makes them smaller, glued the front and back together using some heavy-duty E-6000 glue and voila! DHARMA DOG! Esther, when you make the tag, try making the hole a little bigger. My first one broke but I think it's because the hole was took tight on the little carabiner I have. In the one I'm finishing up now, I made the hole a little bigger and bought tiny key chain rings from the craft store. My shrinky dinks don't flatten out completely, so I'm left with two octagons that don't quite fit together (but other than that, they came out great). I think I'll have to make do with two separate tags. All that's left is to get more key chain rings :) Thanks again! Mine are both a little off too. Make sure when you bake the Shrinky Dinks they go all the way flat, but either way it's hard to make them match up perfectly. I just put them together and align them whichever way looks best (so usually I align them on the top). Send in a pic when you're done! These look amazing! And reading about Shrinky Dinks really takes me back. Glad to hear they're still around so I can share them with my daughter when she's old enough. Wow that looks really great! 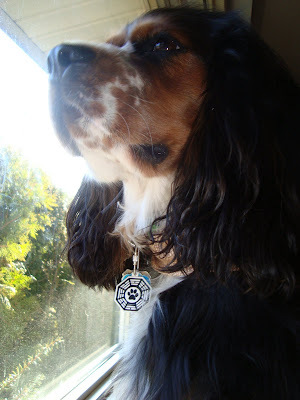 I have been thinking about making a SD tag for my dog, Piper, but never got around to it. Your photos have inspired me! There's Shrinky Dinks brand paper and some other shrinking paper which is the same concept, though it works a tad differently than SD (this other brand is at AC Moore). But make sure when you get the paper that is specifically says it can be used in inkjet printers. The first paper I bought couldn't be inkjetted, so instead I made some goofy charms with Sharpie markers. Oh and after the initial shrinking and pre-glueing I sprayed them with a matte coating.